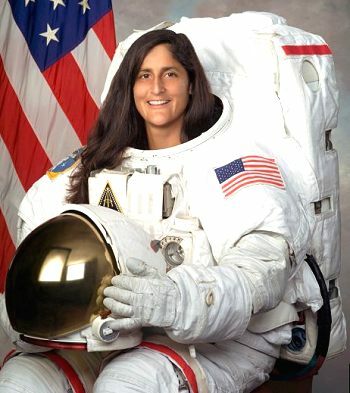 Hyderabad: Sunita Williams, Indian-born NASA astronaut and Rakesh Sharma, the first Indian spaceman will take part in the 58th International Astronautical Congress (IAC-2007), which is going to be started on September 24 at Hyderabad International Convention Centre. ISRO Director B R Suresh said that Mr. Sharma and Ms. Sunita would join on September 28, the concluding day of the meeting. Prithiviraj Chauhan, Union Minister of State for Prime Minister Office Affairs would inaugurate the five-day conference, which is hosted by Astronautical Society of India (ASI) and Indian Space Research Organisation (ISRO). International Astronautical Federation (IAF) would be organizing the event, Dr. Suresh added. Over 200 delegates would attend the conference, in which 125 techinical sessions would be organised and 1,250 papers presented. James Zimmermar, IAF President said the two future conferences in 2008 and 2009 would be held at Glasgow in Scotland and Republic of Korea correspondingly. Space exhibitions and discussions on the current growth in space technology would form part of the meeting.